Topological Surveys - C.C. 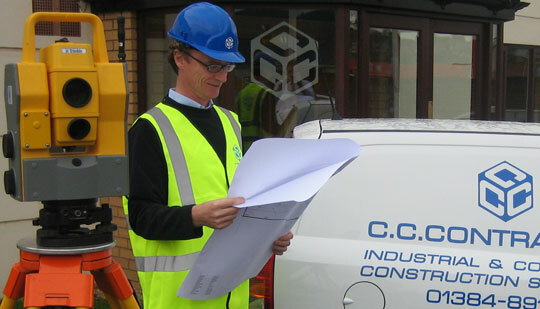 Contracting Ltd.
Our skilled surveyors offer a fast and cost effective land survey service. Using the very latest topological surveying equipment, our in-house surveying team, based in the West Midlands are able to offer a fast and cost effective land survey service. Using our state of the art robotic equipment we can turn a survey around in a short period of time and forward drawings digitally in a variety of formats to suit your needs, allowing you to overlay your layout designs on accurate up to date survey data. The greatest benefit of this service is in our ability to really assist in streamlining the process of taking projects from conception to completion. Our 3D modelling capabilities and earthworks calculations allow us to produce designs for your final drawings. The use of new technology in construction enables us to be as efficient as possible. The basis of a true turnkey design and build package and the key to a successful business. Using the latest robotic surveying equipment, C C Contracting offer a fast and efficient site surveying service tailored to your requirements. The accurate data acquired can be presented in various electronic formats to suit various CAD requirements as well as in traditional A1 paper drawing format. As well as site surveys typically for sale, purchase or development purposes, we can also carry out volumetric calculations allowing us to measure stockpiles or calculate cut and fill quantities for development projects. Please contact us to discuss any requirements you may have, we will be happy to assist where we can. © 2019 C.C. Contracting Ltd.